An experience that will excite your every human nerve! ELFIT Reebok is an international fitness competition that’s unique in the way it combines the elements of a thrilling competition, an exceptional community and an overall amazing spirit. 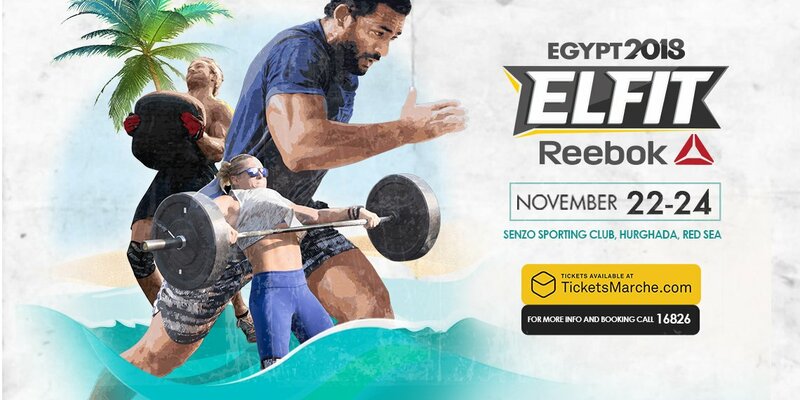 Returning for its 6th season ELFIT Reebok will take place on the 22nd, 23rd & 24th of November, where cross fit athletes, from all over the world from more than 40 countries are coming down to the beautiful city of Hurghada along Egypt’s mesmerizing red-sea coast to battle it out at senzo sporting club. Not only will every single event be extremely enjoyable and exciting to watch, but you will also be meeting a lot of people from the fitness community (athletes , spectators, organizers and volunteers) from different countries, where everyone shares their love for fitness, health and well-being. Plus you will be enjoying ELFIT cool vibes, inspiring atmosphere, a festivalof respect to every sweat drop every muscle cramp every cry of celebration. Just by having the spectator's ticket, you will automatically enter the draw to win some really cool gifts— if you’re lucky! Many sponsors will be giving away gifts for our crowd. Aside from exciting entertainment pieces in our breaks, there'll be sponsors and vendors from all over the world in this area to showcase their products and have activations and games and small contests with awesome prizes. And of course, there'll be food! ELFIT Reebok is an experience you surely don’t want to miss!